I have a new book coming!!!! I’m soooooo excited, because I can finally share the details of the Super Secret Project that I’ve been working on for ages! 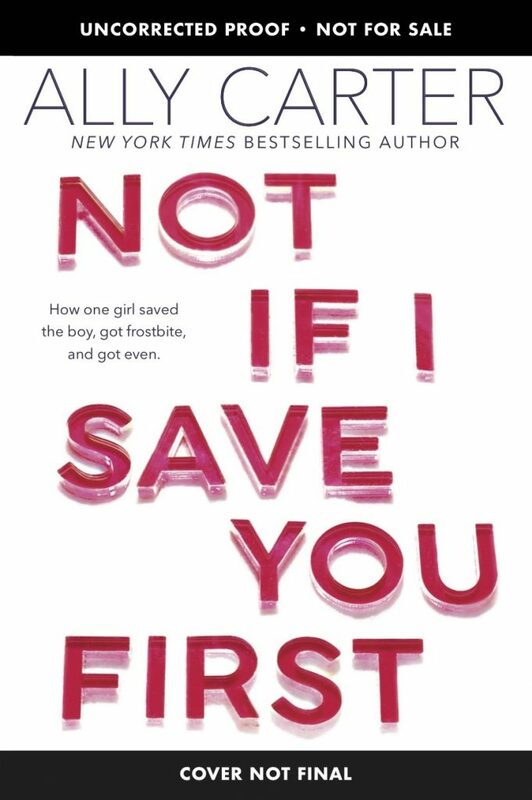 NOT IF I SAVE YOU FIRST is the tale of Logan and Maddie, who used to be best friends–back when she was the daughter of a Secret Service Agent, and he was the son of the president. But then Maddie’s dad moves her to middle-of-nowhere Alaska and Logan stops replying to her letters. Then, all of a sudden, Logan’s back in Maddie’s life and, needless to say, she really wants to kill him. But a kidnapper snatches Logan, and, instead, Maddie has to save him. It’s such a fun, funny, romantic book, and I think you guys are going to looooooove it. And Logan. And Maddie. And Alaska. Because, let’s face it, Alaska is awesome! SERIES? : Nope! This one stands alone! ADVANCED READING COPIES: There will definitely be some, but I’m not exactly sure how/when they’ll be distributed. Stay tuned! But, that being said, I know the UK is hard at work on their cover and marketing plans and everything, and I think they’re planning on publishing next spring as well–hopefully sometime around when the book drops here in the US. COVER: Stay tuned! We’re working on it, and it’s going to be awesome. In the meantime, this will have to hold you over. I hope you guys are as excited as I am. I truly think you’re going to love it. And now I’ve got to go get to work on my NEXT Super Secret Project! Sorry it has been so long since we posted on the blog but Ally has been super busy with writing book #3 in the Embassy Row Series and all the never-before-seen epilogues for all six Gallagher Girl books! What happens to Cammie after graduation? Get the books and find out on June 14! The other exciting news is that we have been working on a new look for the website!!! I can’t wait until its done because you guys are going to LOVE it! So please be patient and keep checking back because we have a new look coming and some other fun things ahead! The new Gallagher Girl covers are here! As many of you have probably already heard, this spring marks the ten year anniversary of the release of I’D TELL YOU I LOVE YOU, BUT THEN I’D HAVE TO KILL YOU! What a crazy, wild, awesome ride it has been. In honor of this occasion, my publisher, Disney-Hyperion is re-issuing the entire Gallagher Girls series with all new covers and all new, never-before-seen epilogues for all six books! And now it’s my pleasure to reveal what those new covers are going to look like! I’m THRILLED with how they turned out, and I hope you guys will like them too. I’m so, so, so happy to have these new editions coming, and I hope you guys are as excited as I am! There is a ton of fun stuff going on in Ally Carter Land right now! First you can see her in person this Friday in Tulsa, OK at the Junior League of Tulsa Holiday Market Christmas and Croissants event. For tickets go HERE! Also, there is a great little article that the Junior League of Tulsa did and you can read it HERE! And the really big news….. THIS IS A WATERMARK BOOKS & CAFE EXCLUSIVE! Order your copies now to receive them before Christmas. For all the details please go to the Watermark Books & Café site. Hope everyone is having a FANTASTIC week!! Ally here with what I hope will be VERY EXCITING news! Now, this is where I usually ask y’all if you like it, but I am kind of past caring if anyone else likes it because I love it so darn much. You see, it fits this book so perfectly! And it has always been the title in my mind–ever since we decided to call book one ALL FALL DOWN. I can’t tell you what a relief it is to finally be able to use this title publicly. I’ve been worried I was going to spill the beans for months now! And that isn’t all, oh no. As you’ll see from the super pretty graphic, we are going to be hosting a live chat next TUESDAY at 6:00 EST to reveal the cover as well! I’ll be talking about the series, answering questions and chatting with you. Plus, there will be some very special guest stars dropping by to say hi. I’m super, duper excited about it! And I hope you’ll all join me! ps: don’t forget, I’ll be at the International Spy Museum May 15th and the Gaithersburg, MD Book Festival on May 16th. Come see me! There is a FREE Download of a short story all about Grace!! Just click HERE and head over to Amazon for the FREE download. All Fall Down is HERE! Today is the day!!! All Fall Down is now available!! And what is better than getting Ally’s new book? Getting a signed copy and meeting Ally of course!!!! Here are you chances to see Ally in person starting with TONIGHT!!! **Purchase may be required. Check with Anderson’s regarding their store policies. Of course we will be adding dates to this list so please keep checking back! Ally not going to be in your area? No problem, we will be having lots of fun giveaways in the next few months here on the blog. Ally here, and today I’m going to tell you a story. You see, last December I had just turned in the first draft of ALL FALL DOWN to my editor, and I had a little time off while I waited for Editor David to read the draft and tell me what I needed to work on in draft 2. So I did what any self-respecting person does when they are faced with a few free days in December: I put on my stretchy pants and fuzzy socks and proceeded to watch about 200 cheesy holiday made-for-TV movies. You know the ones? Where the plunky heroine and hunky hero trade barbs and banter under mistletoe and while sipping cocoa and are frequently snowed in together until they must face the fact that THEY ARE IN LOVE! And they must SAVE CHRISTMAS. I KNOW you guys know those movies. And I bet you love them just as much as I do. So I was watching a lot of those and, of course, tweeting the whole experience. It was fun. Then I got a text from my friend, New York Times Bestselling author and all-around sweetheart Stephanie Perkins. “Can I call you?” Steph’s text said. “Sure,” I texted back, totally unsure what this could be about. So then a few minutes later my phone rang and, sure enough, it was Steph, who had, of course, seen my various tweets about my new all-consuming passion for cheesy holiday movies. “How would you like to write one of those stories?” Steph asked. “I’d love to!” I said. “Sold!” I said, and true to her word, a few weeks later Steph had assembled an amazing list of authors and sold the book to St. Martins. I am so honored to be a part of such a wonderful collection! But don’t take my word for it. The anthology has garnered FOUR STARRED REVIEWS (and anthologies almost never get a single starred review), and has been beloved by everyone. So if you’re in the bookstore, pick up a copy and check it out. And, of course, you can look it up online as well. Such a fun way to kick off the holiday season! As certain as Grace is about these facts, nobody else believes her–so there’s no one she can completely trust. Not her grandfather, a powerful ambassador. Not her new friends, who all live on Embassy Row. Not Alexei, the Russian boy next door who is keeping an eye on Grace for reasons she neither likes nor understands. Everybody wants Grace to put on a pretty dress and a pretty smile, blocking out all her unpretty thoughts. But they can’t control Grace–no more than Grace can control what she knows or what she needs to do. Her past has come back to hunt her . . . and if she doesn’t stop it, Grace isn’t the only one who will get hurt. Because on Embassy Row, the countries of the world all stand like dominoes, and one wrong move can make them all fall down. 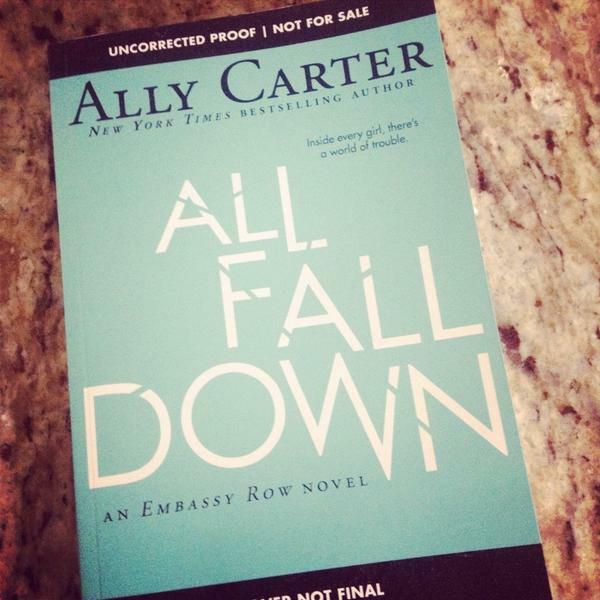 As many of you saw yesterday, we are finally able to share the official cover for ALL FALL DOWN: an Embassy Row novel. Do you love it? I love it. You can also read the first two chapters if you haven’t already. I hope you guys are as excited about this new series as I am. Truly. I have been so blessed to get to write the Gallagher Girls and Heist Society, but I think ALL FALL DOWN might be my best book yet, and I just can’t wait to share it with all of you. Thank you so much for the kind words about the Star of Bethlehem excerpt! I really love this story (and its characters) and I’m happy that you guys are liking it too. And I’m soooooo honored to be a part of the MY TRUE LOVE GAVE TO ME anthology! It has already received one starred review from one of the major review journals, and a rave review from RT Magazine. It is a thrill to be a part of a project so special. And someone else asked whether any of the characters/stories will tie into any of the authors’ existing stories/worlds, and I’m happy to answer that these stories are all 100% original and exclusive to this anthology! You will only see these characters here. Now I’m going to go stare at the box of Advanced Reading Copies of ALL FALL DOWN that just came in the mail. They’re so pretty! And I’ve got to figure out the best possible contest to give a few of these beauties to a few of you!